The Atomic Heritage Foundation is sad to report that Manhattan Project veteran Jack Aeby passed away on Friday, June 19th, 2015. Jack came to New Mexico in 1943 and became one of the first civilian employees (#25) on the Manhattan Project.. He worked in the Physics Group under Enrico Fermi and Emilio Segre. He secured his place in history as the man who took the only color photograph of the first atomic bomb test at Trinity July 16, 1945. He reestablished Boy Scout Troop 22 in Los Alamos during World War II. In 1946 he worked as a photographer for Operation Crossroads and Special Representative of the Press for the Mound City News-Independent. Following the war, as a graduate of Berkeley, he returned to Los Alamos and purchased property in La Mesilla in 1949. He retired from the Health Physics department at the Los Alamos National Laboratory after twenty years. He then began a second career with Eberline Instruments, dedicated to the clean-up of radioactive sites across the country as well as the Marshall Islands of the South Pacific. 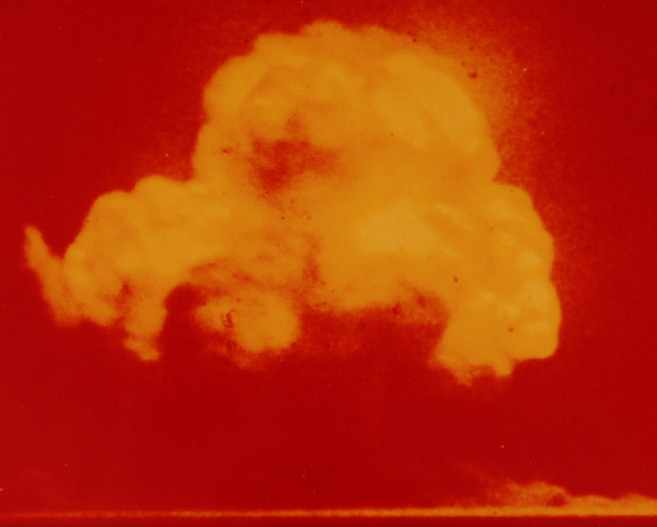 His color photo of Trinity, one of the ten most reproduced photographs appears in reverse on the cover of Richard Rhodes’ The Making of the Atomic Bomb, On Forgiveness by Richard Holloway, and other books and magazines. AHF recorded a terrific interview with Jack in 2003, which can be watched on our "Voices of the Manhattan Project" website here.